It is a bright spring evening as the Lord-Lieutenant of West Sussex, Mrs Susan Pyper, leads a gathering of friends and supporters at St Mary’s House and gardens, Bramber. We have come together to celebrate thirty years of conservation and restoration led by Peter Thorogood and Roger Linton. The paths to the house and gardens are lined with primroses, violets and forget-me-nots, proof that spring has finally arrived. Guests include those who have supported Peter and Roger over many years in their desire to preserve and share the delights of St Mary’s House, Bramber. 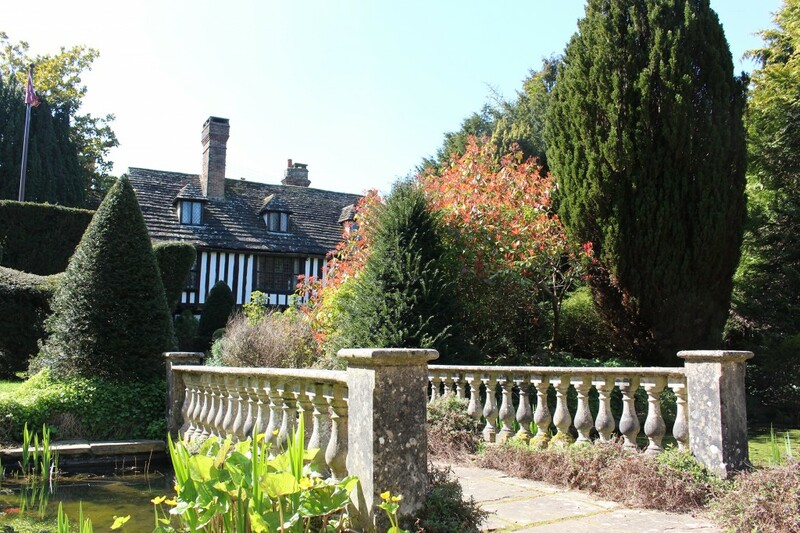 The house we see today incorporates the surviving wing from the late 15th century when William of Waynflete, the Bishop of Winchester, built a new Chapel House around a galleried courtyard. The house is a good example of the use of close set vertical timbers known as close studding which became widespread in Sussex at that time. The vision, dedication, hard work and generosity of Peter Thorogood and Roger Linton has permanently written their names into the story and history of this grand old house and her gardens. They have gathered a community of people around the house and gardens who have also offered their resources, time and talents to this project. In the wonderful music room, with its large windows and gothic revival fireplace, Susan Pyper, The Lord-Lieutenant of West Sussex, speaks affectionately of the pleasure of returning “to be amongst friends”. She thanks the Friends of St Mary’s House and all those who had played their part in this evolving project as supporters and donors. Turning her attention to Peter and Roger she praises them saying that their “generosity of spirit knows no bounds.” Mrs Pyper acknowledges St Mary’s House and gardens as “a jewel in the crown of West Sussex with an international reputation.” The charitable trust, set up to support the house and gardens for the public’s benefit, has given an Acer Palmatum de shojo. 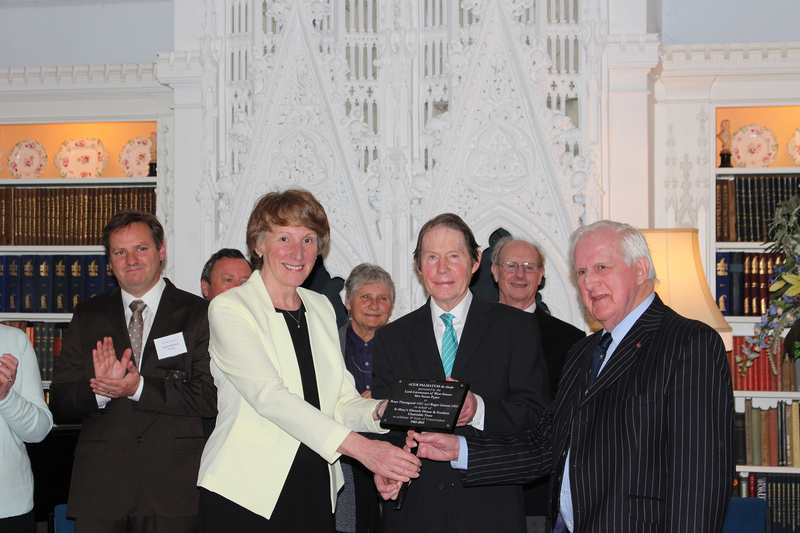 Susan Pyper presents Peter and Roger with a commemorative plaque to accompany the tree and occasion. Peter Thorogood responds saying that St Mary’s, Bramber is “all about people”. He notes the “friendly atmosphere and generosity” of all who had been involved in the house and gardens. These sentiments are echoed by Roger Linton who, reflecting on the visitors before the reception, remarks upon how he gains such “pleasure from their pleasure”. Peter and Roger’s work and aspirations give expression to a deep sense of calling and vocation to this place and their vision to share St Mary’s with all of us. These ambitions have been at the heart of their lives and work. They richly deserve our thanks. Whether visiting for the first time or returning to an old friend, as I often do, St Mary’s, Bramber never fails to delight with its architecture, collections, gardens and sense of history. 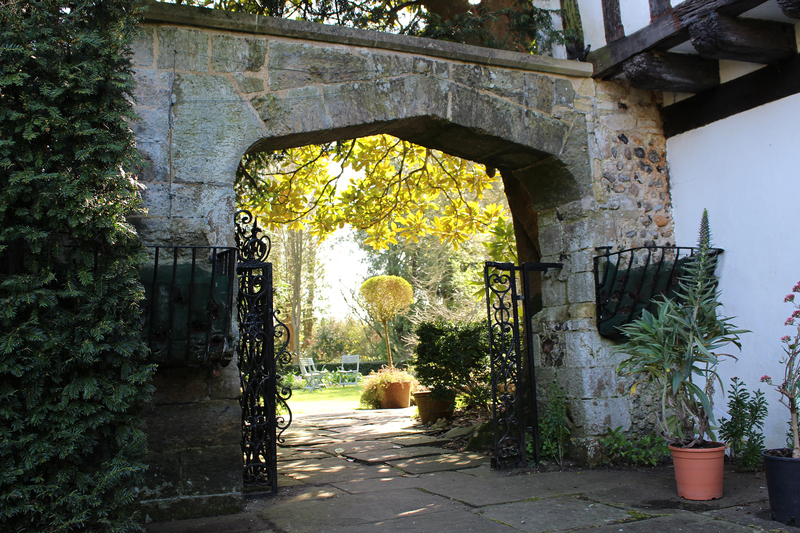 St Mary’s House and gardens opens to the public for the 2015 season this coming Bank Holiday Sunday afternoon, 3rd May, 2-6pm. For further details go to www.stmarysbramber.co.uk or telephone 01903 816205. By Revd. Rupert Toovey. Originally published on 29th April 2015 in the West Sussex Gazette. 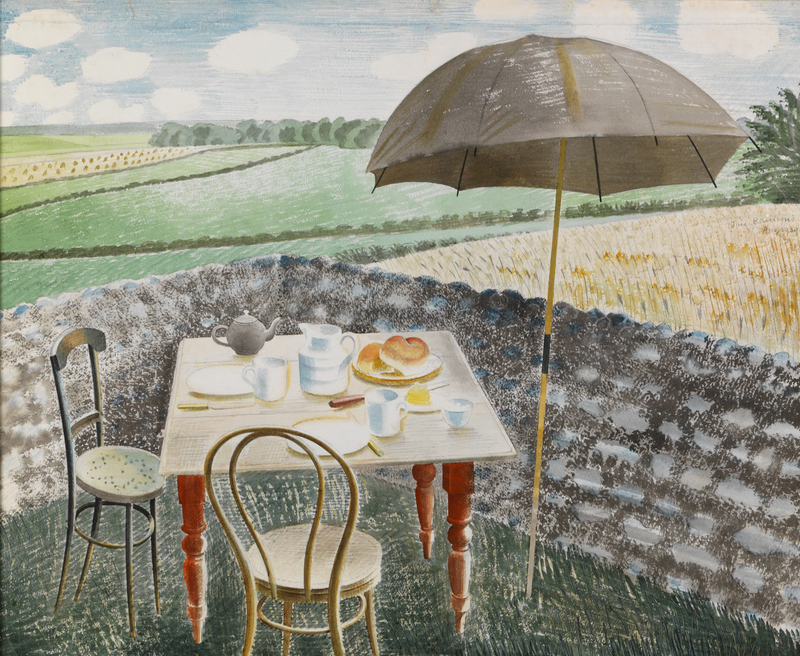 An exhibition titled ‘Ravilious’ has just opened at the Dulwich Picture Gallery. It focuses on the watercolours of the celebrated artist and designer, Eric Ravilious. 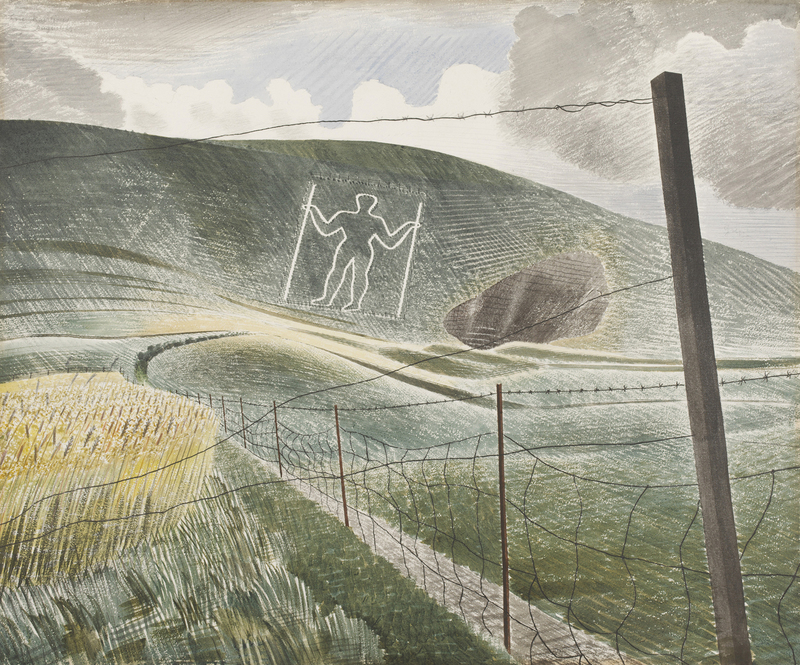 Ravilious has been described as one of the finest watercolourists of the 20th Century and his life and work has strong connections to Sussex. During Eric Ravilious’ lifetime watercolour painting underwent a revival. This most English of mediums and traditions was fused with modern ways of seeing and painting. The graphic, linear approach to the medium resulted in a very English Modernism. Born in 1903, Eric Ravilious’ childhood was spent in Eastbourne where his father ran an antiques shop. In 1934 Eric Ravilious, once again, returned to Sussex staying at Furlongs with Peggy Angus who had rented a shepherd’s cottage in sight of Firle. Here he painted landscapes and local scenes. The exhibition highlights that his work is rooted in the landscape and life of pre-war and wartime England. Sussex and the South Downs are strong influences. Interior and domestic scenes are a recurring theme in his watercolours. Take for example ‘Tea at Furlongs’ painted in 1939. This domestic scene captures a moment in time at odds with the war which would imminently engulf our nation. The table is laid with an appealing English afternoon tea, placed in a natural landscape. The garden at Furlongs is truthfully depicted by the artist. Light and movement appear to dance across the surface of the paper. The gentle distortion of perspective heightens the viewer’s connection with the scene, its composition drawing us in. Ravilious’ ability to be economical in choosing detail and his use of shapes and distorted perspective is always informed by the needs of the compositions in his watercolours. 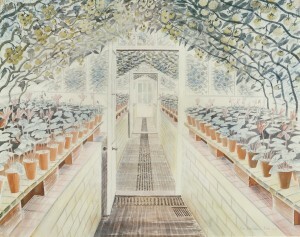 The discovery of a greenhouse at nearby Firle Place in 1935 was the inspiration for ‘Cyclamen and Tomatoes’. The exemplary composition beguiles the viewer. Orderly rows of terracotta flowerpots are framed by the arched canopy of tomato vines. A series of similar watercolours followed. There is a stillness which is out of time, a quality often found in his paintings. Edward Bawden, his lifelong friend and fellow artist, would recall how Ravilious worked straight onto the final piece without preparatory sketches. He would lightly sketch in the main forms in pencil and then areas of paint in turn rather than working across the entire sheet of paper. A white resist was used to preserve white throughout the whole process. This practice gifts his work with an immediacy and liveliness of invention. In 1944 the poet and dramatist Lawrence Binyon wrote describing how Ravilious employed under-painting, elaborate superimposed washes and stipples resulting in great delicacy and definition. His style built on the tradition of late 18th and early 19th century English watercolour painting. As he re-examined work by artists like John Sell Cotman he found a very English corrective to modernism resulting in his emotionally cool and intensely structural paintings. In December, shortly after the outbreak of war on the 3rd September 1939 Ravilious toured and recorded England’s chalk figure sites. 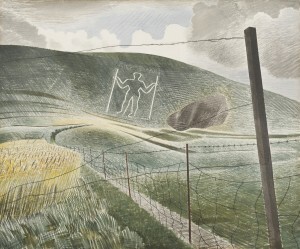 The Long Man of Wilmington was familiar to Ravilious from his childhood. Ravilious likened the ‘Wilmington Giant’, near Eastbourne, with a figure of Virgo holding staves in the frescoes of San Gimignano by Bartolo di Fredi of ‘Scenes from Creation’. The lines of the barbed wire and distorted mesh fence draws the eye to the tilted figure. The patch of corn answers the flash of blue in the sky, the hatching in the fields and hill echoed in the scudding clouds. This is a landscape which speaks of the English and the ancient. At the outbreak of war Ravilious had joined the Observer Corps at Castle Hedingham, becoming a war artist in 1940. He would often fly with the RAF. The remarkable study ‘Hurricane in Flight’ depicts two Hurricanes banking. The artist’s technique is once again illustrated. The bi-plane wing concentrates our eye on the fighter planes in an extraordinary composition. The scene is framed against the patchwork quilt of fields in the timeless English countryside. Here the common threads which unite Ravilious’ paintings in peace and wartime are displayed. Threads which are central to the Dulwich Picture Gallery’s exhibition. 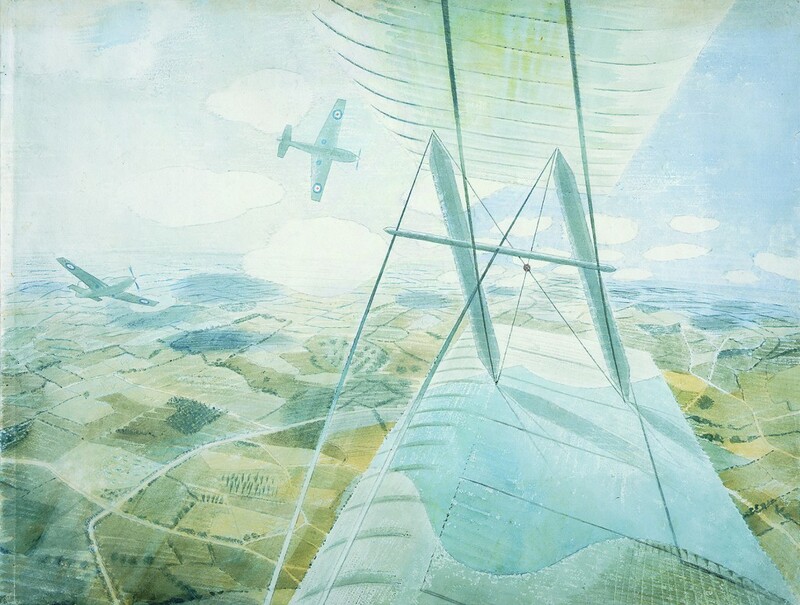 Ravilious was lost when the air sea reconnaissance mission he had joined in a Hudson aircraft failed to return from its search. He died with the airmen he so admired. 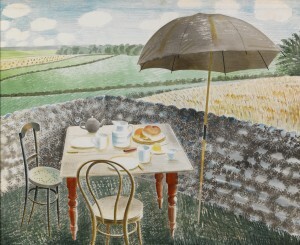 Ravilious’ sensibility was modern but his techniques were not. Texture, light and movement connect the artist’s work to the English Romantic tradition but with a particular and fresh voice. It is at once figurative and yet highly stylized. Watercolour, a most English of mediums, is fused with modern ways of seeing and painting. His graphic, linear approach to the medium resulted in a very English Modernism in peace and wartime. This superb chronological exhibition allows us to see Eric Ravilious’ development as an artist and the techniques, themes and subjects which unite his peace and wartime work. ‘Ravilious’ runs at the Dulwich Picture Gallery until the 31st August 2015 and is one of this year’s must see exhibitions. For more information go to www.dulwichpicturegallery.org.uk. By Revd. Rupert Toovey. Originally published on 22nd April 2015 in the West Sussex Gazette. With the second teaser trailer coming out for the forthcoming Star Wars movie we couldn’t resist a tenuously-linked blog post! The above woodblock illustration is not from a galaxy far, far away but in fact from a copy of Prodigiorum ac ostentorum chronicon by Conrad Wolffhart (1518-1561). The book was printed in Basel by Heinrich Petri circa August 1557 – so still a long time ago! 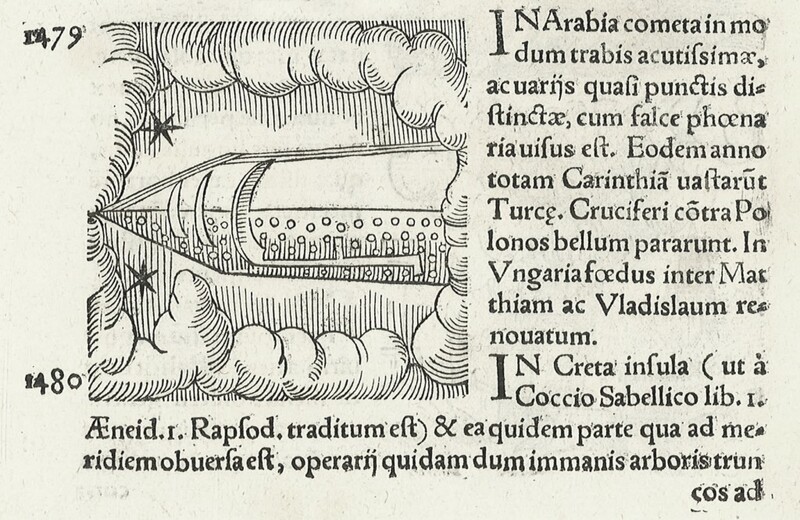 According to the text it actually depicts a comet flying over Arabia in 1479, but conspiracy theorists could argue this is the earliest printed image of a spaceship. The resemblance is beyond doubt. Wolffhart’s work includes a number of woodcut illustrations and is an encyclopaedic anthology of weird and wonderful curiosities and natural wonders. Represented are other comets, including Halley’s comet, but also prodigies, portents and monsters. The scene of frogs raining down from the sky gracing the front cover of the printed catalogue is also from this volume. The book is offered as Lot 3134 in Toovey’s Specialist Book Auction on 21st April 2015 and carries a pre-sale estimate of £400-600 and specialist Nicholas Toovey states “due to the condition we have rightly been cautious with the estimate but expectations could be exceeded due to the interesting nature of the book.” Perhaps the Force will be strong with this one! John Piper was one of the leading artists of the 20th century Modern British Art Movement. He worked in the abstract, romantic and classical traditions as a painter, ceramicist, writer, designer and printmaker. 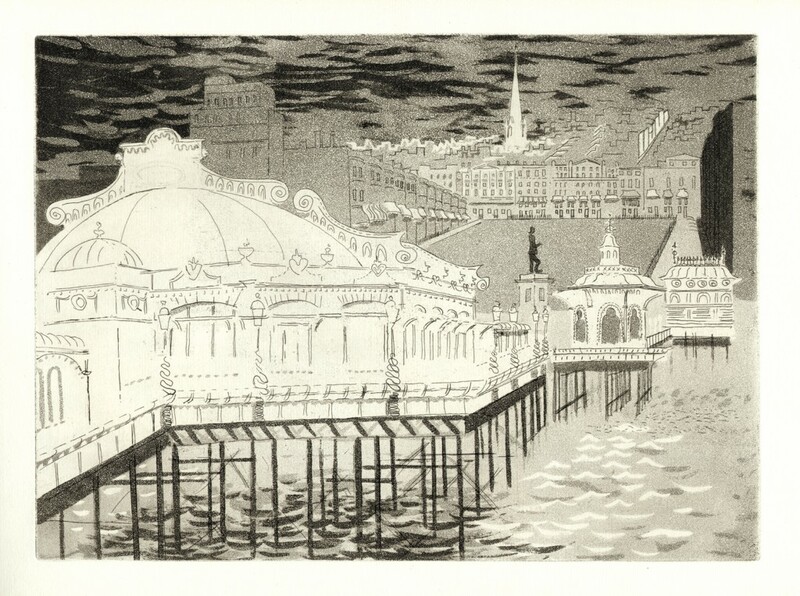 Piper’s 1939 illustrations for the book ‘Brighton Aquatints’, have been credited with the revival of the aquatint as a 20th century print medium in Britain. The book consist of twelve aquatints of Brighton. Two hundred standard copies were printed and a further fifty-five copies were hand-coloured by the artist. The prints were not signed, although Piper did sign and dedicate some copies of the book. The illustrations were printed by the two Alexander brothers who had a basement workshop in Henrietta Street, Covent Garden, London. The watermarks which appear in the paper are irregularly placed and are styled as a hand raised in blessing, a head, said to be that of Christ, and the date 1399. Rooted in the English tradition John Piper’s work often relates to a place, be that a landscape or a building. Piper brings a particular quality of engagement to his subjects. He captures the poetic, his emotional response and thoughts, as well as the essence of the physical reality. These themes and responses belong to the English Romantic tradition. Piper seeks to look beyond what is immediately apparent; to what the artist Paul Nash referred to as the ‘genius loci’, the spirit of the place, ‘a reality more real’. John Piper’s ‘Brighton Aquatints’ combine technical innovation with exceptional draughtsmanship, complexity and detail. They are accompanied by a very personal introduction by Lord Alfred Douglas and notes to each image by the artist. This ‘Piperesque’ view of Brighton re-acquaints us with the familiar. 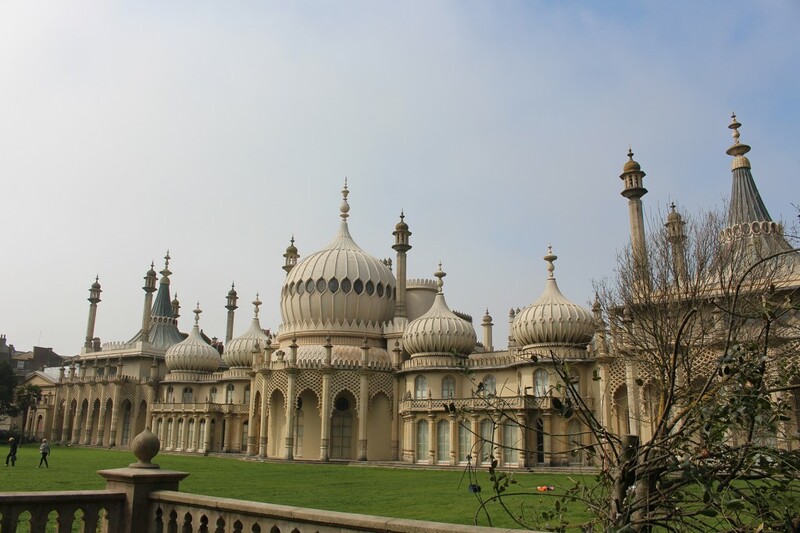 I was in Brighton last week as a sea fret rolled in causing the Brighton Pavilion to shimmer in the bright spring sunlight. 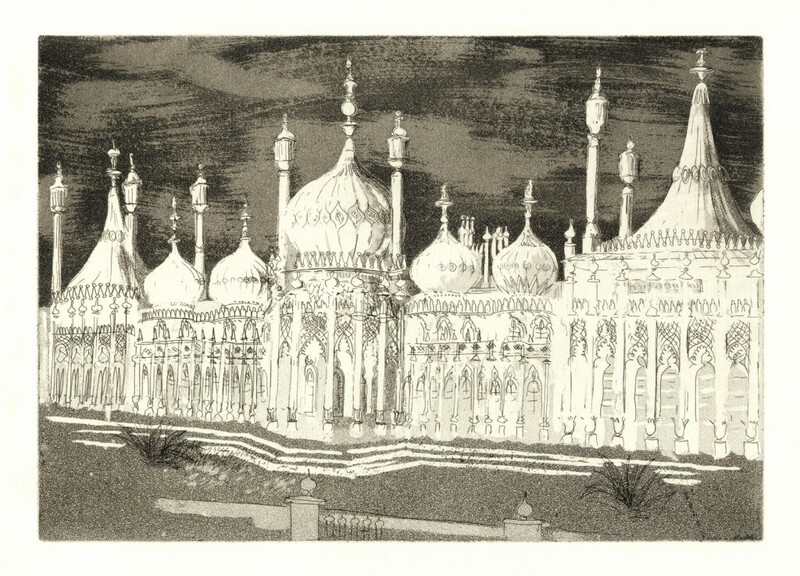 The scene was reminiscent of Piper’s view of the ‘The Royal Pavilion’ which remains remarkably unchanged from his 1939 aquatint. In his notes Piper describes the building’s extravagant beauty and the great affection in which it is held. In ‘Regency Square from the West Pier’ we are reminded of a view now lost to us. John Piper describes how the pier appears like a ‘dazzling white meringue, brittle and sweet…florid and grand as anywhere.’ Regency Square is laid out on a gentle slope in the view beyond. In both these aquatint prints the use of acid at different stages in the process has created the texture of the grass and background. Stopping out varnish repeatedly applied has been used to create the waves and skies. John Piper wrote quoting Constable ‘Painting is with me but another word for feeling…’ Piper’s ability to use landscapes and buildings as a focus for his emotions has the effect of gifting the world with, what has been described as, ‘a human sensibility’. These qualities are apparent in ‘Brighton Aquatints’. His work gives an extraordinary articulation of the English vision and spirit. By Revd. Rupert Toovey. Originally published on 15th April 2015 in the West Sussex Gazette. One of the best known of all Japanese woodblock designers is Utagawa Hiroshige (1797-1858). Hiroshige’s landscape prints are internationally acclaimed and are amongst the most frequently reproduced of all Japanese works of art. They are defined by their unusual compositions and humorous depictions of people involved in everyday activities. His exquisite observation and depiction of weather, light and season are exemplary. Hiroshige’s work proved hugely influential for many leading European artists including Claude Monet and Vincent van Gogh. Hiroshige worked in the latter part of the Edo or Tokugawa period (1603-1867). The Tokugawa shogunate had become the unchallenged rulers. It resulted in what has been described a ‘centralized feudal’ form of government. In contrast to this agrarian society a vibrant community of merchants and businesses grew up in towns and cities in the early and mid-19th century, at the time Utagawa Hiroshige was working. For the first time urban populations had the means and leisure time to support a new culture of theatres, geisha and courtesans. This search for pleasure became known as ukiyo (the floating world), an ideal world of fashion and entertainment. Pictures and prints depicting images of the everyday in this new society became known as Ukiyo-e – scenes of the floating world. 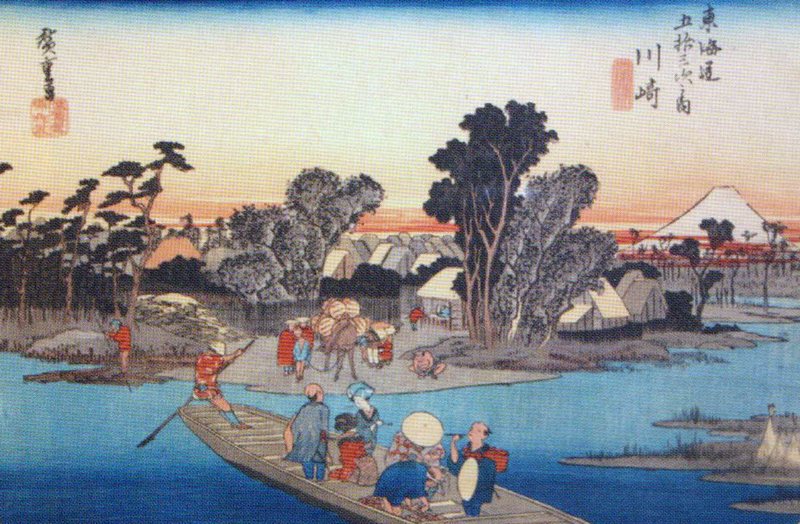 However, Hiroshige’s depiction of people is recurrently bound up with the landscape. Hiroshige combined his print making with his inherited position as a fire warden. In 1832 he was invited to join an embassy of Shogunal officials on a journey which allowed him to observe the Tokaido Road, the Eastern sea Route which followed the coast through mountain range to Kyoto. The resultant series was called ‘Tokaido Go-ju-san-Tsugi’ (The Fifty-three Stations of the Tokaido). The three prints illustrated are early states of the polychrome woodblock oban prints from this series. They date from around 1833. Oban refers to the most common size of Japanese print usually measuring approximately 23.5cm x 36.5cm. The production of Japanese woodblock prints involved the artist, whose design would be pasted to the block so that the engraver could cut it. Straight grained cherry was often used as it allowed for fine detail to be carved. The printer would then print the image. As many as ten blocks were used to achieve the diversity of colour. At each stage of the process proofs would be made for approval. 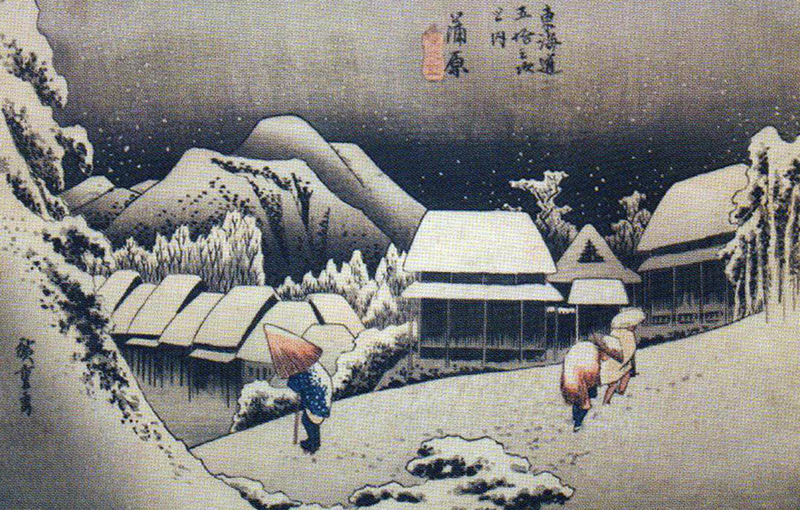 Hiroshige’s lyrical depiction of ‘Night Snow at Kambra’ is poetic. We are left with a sense of the stillness and silence which often accompanies snow. It is late and no lights are apparent in the houses below as the villagers trudge home. 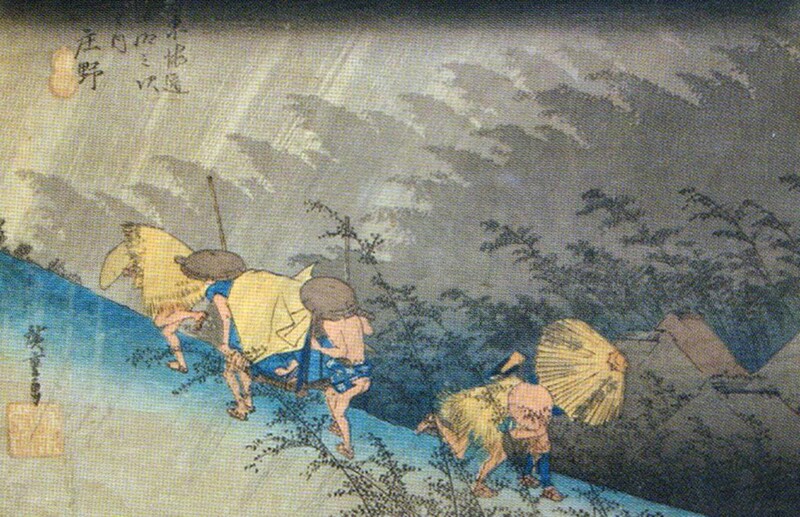 In contrast ‘Rain storm at Shono’ portrays farmers and porters running for shelter as the sudden downpour of rain darkens the sky and obscures the mountains. The figures, angle of the rain and the wind in the trees, lends the image a sense of urgency and movement. In ‘The Rokugo Ferry at Kawasaki’ we witness pedlars and women on a pilgrimage, in a ferryboat. On the far shore a laden pack-horse and palanquin wait, with Mount Fuji on the horizon beneath the sunset. These three examples formed part of a collection of eight polychrome woodblock oban prints from the The Fifty-three Stations of the Tokaido series by Utagawa Hiroshige. There is always a premium for early states and they realised a total of £17,500 in two lots at a Toovey’s specialist auction. Blocks would often be altered and reused. These later states can still be bought for a hundred or two and represent wonderful value for the potential collector. This important artist dominated Japanese landscape printmaking and was a major influence for many leading European artist. Utagawa Hiroshige’s scenes so often depict travellers along famous Japanese routes providing us with captivating sights. But it is the intimacy with which he portrays people in snow and rain in all seasons which never ceases to delight me. By Revd. Rupert Toovey. Originally published on 8th April 2015 in the West Sussex Gazette.